Around the year 59 BC, Julius Caesar established a settlement for his veteran troops in the fertile river valley of the Arno. The same site had likely already been an Etruscan settlement and, by some speculation, occupied since prehistoric times. Although its population waxed and waned, the city persisted and, starting some 14 centuries after its founding, flourished as a center for commerce, art, and science. Credited as the birthplace of the Renaissance, Florence (or Firenze) was the permanent or part-time home of Giotto, Dante, Botticelli, Donatello, Michelangelo, Leonardo da Vinci, Machiavelli, Vasari, and Galileo. Today, this United Nations Educational, Scientific and Cultural Organization (UNESCO) World Heritage Site holds perhaps the greatest concentration of world-renowned artwork anywhere on Earth. 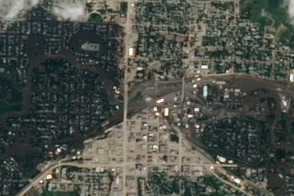 The Advanced Land Imager (ALI) on NASA’s Earth Observing-1 (EO-1) satellite captured this natural-color image of Florence on July 30, 2010. 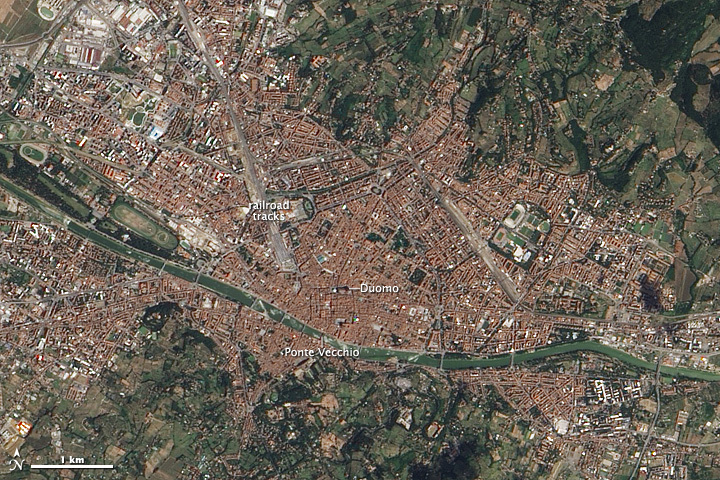 The west-flowing Arno runs through the middle of the image—and the middle of town. Verdant hills rise from the river valley in both the north and south, covered with a patchwork of fields, orchards, parks, and stands of trees. The vegetation is well watered in the cool, rainy wintertime. Summers are typically hot and humid. Over the centuries, Florence’s location proved optimal for agriculture and trade. The surrounding landscape was well-suited to raising crops and livestock, and land- and water-based trade routes—the Arno in particular—passed through or near the city. Today, multiple bridges connect the northern and southern halves of Florence across the Arno. Spanning the river at its narrowest point is the Ponte Vecchio (“Old Bridge”). Earlier bridges built at or around the same spot had washed away in floods, but this bridge has lasted since 1345, a centuries-long home to skillful goldsmiths. Modern structures with big footprints interrupt the sea of red-tile roofs north of the river. Near the center of town, railroad tracks draw parallel lines running north-northwest. West of the tracks and immediately north of the river are racetracks. Near the east of the town sit sports stadiums. Although dwarfed by modern train tracks and racetracks, many of the smaller buildings near the center of town are far more famous. In a plaza north of the river, not far from the Ponte Vecchio, sit the Florence Cathedral (Santa Maria del Fiore) and the Baptistery. The cathedral appears as a cross-shaped building casting a shadow to the north. Its neighbor to the west, the Baptistery, is bright white. Santa Maria del Fiore towers above the city skyline. The building was started in the thirteenth century but the construction of its dome (known locally as Il Duomo) was not completed until the fifteenth, overseen by the architect Filippo Brunelleschi. With a mean diameter of 143.5 feet (43.7 meters) and a height of 295 feet (90 meters), the dome was the biggest built since Antiquity. By some estimates, the Duomo remains the largest masonry dome today. Home to Lorenzo Ghiberti’s Gates of Paradise, the Baptistery may be the oldest surviving building in Florence. The belief that the Baptistery originated as a Roman Temple of Mars persisted for centuries. Even though the time of the Baptistery’s construction remains a matter of research and debate, excavations have indicated that the building sits on foundations dating from the first through third centuries AD. 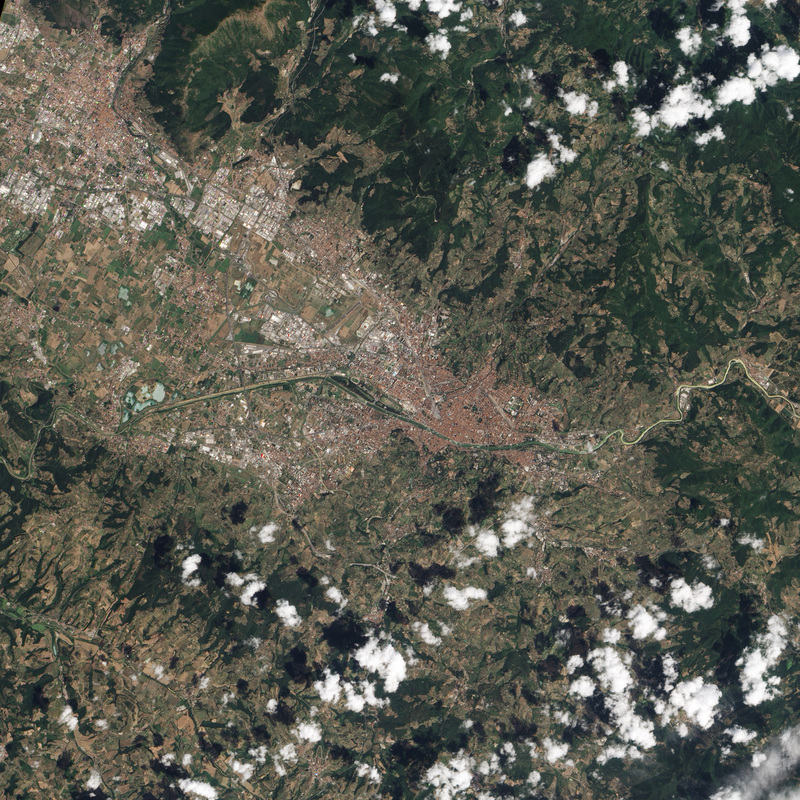 Acquired July 30, 2010, this natural-color image shows the city of Florence, Italy, spanning the west-flowing Arno River. About Florence. History of Florence. Accessed August 15, 2010. Encyclopedia Britannica. (2010). Florence. Accessed August 13, 2010. Giusti, A. (2000). The Baptistery of San Giovanni in Florence. Mandragora, Firenze. King, R. (2000). Brunelleschi’s Dome. Penguin Books, New York. Wikipedia. (2010, July 29). Ponte Vecchio. Accessed August 13, 2010. Wikipedia. 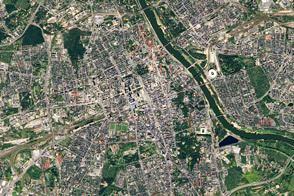 (2010, August 9). Florence. Accessed August 13, 2010. World Heritage. (2010). Historic Centre of Florence. UNESCO. Accessed August 13, 2010.